Boots that fit. Find styles that compliment your figure and fit well. The influx of gorgeous boots that come available in store this time of year is always something to look forward to. However not all boots are going to fit first try, so often there’s a process involved with finding the perfect pair of winter shoes to see you through the colder months. It can be disheartening to see a pair of shoes you love, but then find that they just won’t pull up over your calves or are annoyingly too tight around the ankle. Just like clothes, not every pair of boots will work for all body types and shapes. 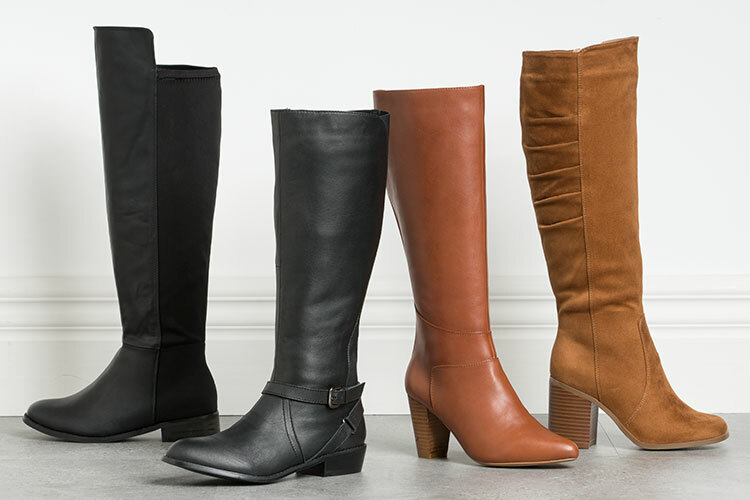 Boots are often an investment piece for your wardrobe, and learning how to select the style that best suits your body shape will reduce your chances of falling out of love with the shoes that you purchase. For women who recognize they need a shoe designed for a bigger calf, the style of the shoe is as important as the heel that comes with it. Kitten and stiletto heels are both best avoided, as are boots with decorative ankle straps. Open toed shoes with a solid heel tend to be more flattering, as well as boots that stop just below the knee. Boots that stop mid-calf are better left for those with smaller legs and women who are looking to add shape to their figure. Knee length shooes are a winning option for those wary of their calves, however they are always best worn in a simple style, dark colour and perhaps with elastic side panels for optimum comfort and fit. Feel like you’re limited? You’ll be pleased to know that there are certain style shoes which in fact look better on women with curves than those without. No matter the shape of your body, there will be something out there designed perfectly to suit you. ● When dressing your lower body and aiming for the slimming effect, darker colours work well. Balance this with lighter colours up top. Restrict prints to your upper body only, and use fun accessories like scarves and jewellery to draw the eye up and away. The monochromatic trend is well on point this season and will not only elongate your leg line, but will also detract from your calves by creating a visual balance. ● Pair a casual knee boot, like a wedge or even a chunky rubber-soled boot, with skinny jeans for an easy-to-wear style. While skinny jeans can be harder for some curvy girls to wear, they add weight to balance your curves. Pair your jeans and shoes with a fitted blazer if you’re an hourglass shape or a longer, looser tunic if you’d rather hide your tummy. Feeling great in an outfit that you’re in can boost your confidence, boost your mood and and add a little spring to your booted steps! Comfortable but on trend footwear is important to see you through winter, and a little bit of time spent searching for a pair that fits your shape well will ensure you reap the long term benefits. Wide calf boots are an investment piece that should be chosen with care. Think quality, comfort, fashion and functionality and you’re bound to put your best foot forward. Have your found the perfect pair of wide-calf boots? How will you be wearing them this winter? Shop the wide fit styles above: Sara Wide Fit 70’s Block Heel Boot, Sara Wide Fit Leather Riding Boot, Sara Wide Fit Over the Knee Boot, and the grey booties; Sara Wide Fit Lace Up Boot.